Fry bacon, cool, drain, crumble, set aside. Start salted, boiling water for spaghetti. Heat olive oil. Saute onion, thin sliced baby carrots, green pepper and fresh garlic clove. Drain pasta. Toss all ingredients together, add more olive oil, fresh ground salt and pepper and be very generous with parmesan cheese. This dish is great the first day and spectacular the second day. There will never be leftovers of this dish! Why I call this dish "Spaghetti Trinidad". When I was about 8 years old, we had a maid named Juliana, who was from Trinidad. She used to make a dish we dubbed "Spanish Spaghetti". Early in my marriage, I was fantasizing about this long ago forgotten taste. I went into the kitchen and started playing around, trying to remember what it tasted like. This is the dish that I came up with and I *think* it's exactly what she used to make us. I renamed the dish in honor of where Juliana was from and wonder whatever happened to her from time to time. Bone and pound chicken to 1/4 inch. Put as much salt & pepper as you prefer into the flour and dredge the chicken. Heat oil in cast iron pan, cook chicken and when almost done, sprinkle lemon juice and capers. This dish has to be done in batches and the chicken cooks quickly. I place the cooked chicken on a plate with aluminum foil to keep it hot. This is a great dish even my kids will eat. If everyone is in the kitchen when I'm preparing it, they stand around like vultures and can hardly wait until it's done. When ready, sear the meat on all sides in a cast iron pan, place in roasting pan with lid. Pour one cup of Teriyaki sauce over meat, then bake low and slow for 3 hours at 275 with lid on. When done there will be a lot of liquid left over at the bottom of the pan. Drain off liquid stock and then separate fat for gravy (use a fat separator). Simmer gently to enhance thicken the left over stock for gravy. In a large pot, cook fettucine according to package directions; rinse under water; drain well. Keep warm. In a large skillet, heat oil over medium heat; coat surface of pan well. Add onions and sauté. Reduce heat to low; add spinach and water. Cover and cook for 8-10 minutes or until spinach is tender. Add ricotta, feta and nutmeg. Simmer about 3 minutes, stirring until cheeses are creamy and smooth. Add more water if necessary. Add cooked fettucine; toss to coat with cheese mixture and heat through. Wash scallops and drain, roll in flour. Saute minced garlic for one minute in butter in cast iron pan. Add scallops, squeeze fresh lemon juice while cooking and when almost done (scallops turn white) sprinkle on the parmesan cheese. Serve with pasta of choice. Options: Add basil, oregano or powdered garlic to dough for added flavor. I use my Cuisinart food processor with dough blade, you could use a bread machine. First add warm water, then salt and honey. Mix for a few seconds and then add the yeast. Let sit for a few minutes. Mix in a cup or so of flour, pulse a few times, then add olive oil. Add the rest of the flour. Turn on and let it go until you have a one giant ball rolling around the bowl. If too dry, add water by the tablespoonful. If too wet, add small amounts of flour. Throw some flour on the counter or cutting board and knead for a minute or two. Place the dough in a covered bowl and store in a warm area to rise. After an hour or so the dough should have doubled in size. Knead the dough for 3-5 minutes. Cover and let rise for one more hour. Roll out the dough. (I use a pizza stone made by Pampered Chef, it works great.) For a real pizza feel, add some corn meal to the pizza stone before you lay out the dough. Now to the the white part of a White Pizza, but a word first, this is my recipe. 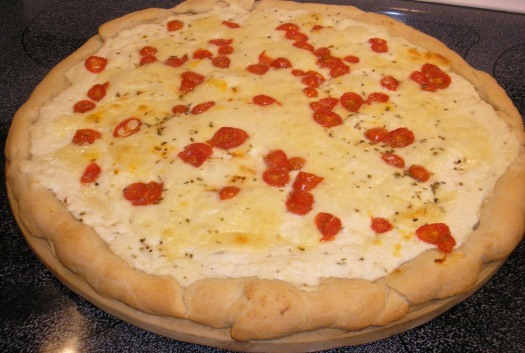 I looked all over to see if there a basic, classic White Pizza recipe and could fine none. Every single recipe is different. So here is my rendition and I must say, it is delish! Bon Appetit! 1/2 container of FRESH mozzarella from Deli section. Ricotta, garlic, salt, half of the parmesan, mix until spreadable. Roll the dough out and place on baking stone. Create an edge with dough. Sprinkle a tablespoon of olive oil on dough. Spread the Ricotta mixture on the dough. 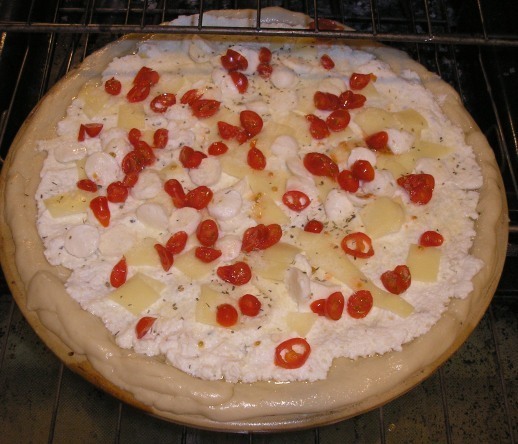 Then add the fresh mozzarella and chopped provolone. Sprinkle with remaining parmesan, add salt to your liking, then Oregano. To prepare rice for this or any sushi dish, rice must be pickled. Combine vinegar and sugar in an enamel saucepan and bring to boil. Cook, stirring, until sugar is dissolved. Remove from heat. Stir 2 tbs. of vinegar-sugar mixture into the cooked, still warm, rice. Warm rice absorbs the mixture more completely. Stir sesame seeds into rice. Making sushi is an art form. I tried to do it the traditional way, using that bamboo roller. If you do it this way, lay a sheet of seaweed then rice and ingredients. Roll with bamboo and cut with very sharp knife into bite size pieces. Press pickled rice into a square on a serving platter. Cut rice into squares, Press each square lightly so that rice clings. Press a bit of crabmeat, caviar, avocado and top with a bit of wasabi paste. Dip into soy sauce and enjoy! Gently boil the chicken breasts and let cool. Cut into large bite size chunks. Cut up broccoli into individual florettes, steam or microwave to partial doneness. If you like crunchy broc at the end of the dish, omit prior cooking. In a large bowl, mix soup & mayo mixture, add a bit of milk if you wish it to blend easier. Add the chicken and broccoli into the soup mixture in the large bowl, mix and coat ingredients well. Then pour into casserole baking dish. Top with cheese and then sprinkle with curry powder (heavy or lightly depending on your taste for curry). Cover with foil. Bake for 1 hour at 350. Uncover foil last 10 minutes of cooking. Kids will eat this dish. Fresh Garlic Cloves, as much as you like. own particular taste. No matter the proportions, it always comes out tasting the same. When I'm out of pinenuts, I use pecans and it adds a hearty, meaty flavor. Great on homemade pasta or use as a dip. Maggi Seasoning - 5 drops or more to taste. Clean crab; mix all ingredients. Form into patties. Bake on baking sheets, sprayed with Pam. Dot each crab cake with margarine. Bake at 400 for20 minutes or until browned. Serve with fresh lemon, tartar or/and cocktail sauce. Mix seasonings, vinegar and beer (or water) well. Put one-half crabs in a very large pot with rack and TIGHT fitting lid. Pour one-half of seasoning mixture over top. Add rest of crabs and remaining liquid. Steam covered, until crabs turn bright red color, about 20 to 30 minutes. Serve hot or cold. Serves 9-12, depending on the size of the crabs. Mix together flour and seafood seasoning. Dredge crabs in flour mixture to coat well. In large fry pan or electric skillet, heat about 1/2 inch cooking oil to 375 degrees Farenheit. Add crabs and turn heat down to 350 degrees. Cook crabs until browned, about 5 minutes on each side. Serves 6 (2 crabs each). No need to salt as ham is salty, or salt to taste. Saute ham and onions in butter or light olive oil, set aside to cool. Beat together eggs. Add milk, beat. Put pie crust on baking sheet. Pour egg mixture into pie crust. Bake 350° about 45 minutes. Check by inserting knife, if it's clean, it's done and should be golden brown on top. Saute spinach and onions with olive oil and/or butter, salt and pepper to taste, set aside to cool slightly. Sprinkle with nutmeg and bake. Directions: Chop by hand fresh basil & cilantro, then add to remaining ingredients. Use as much garlic as you prefer. Or my preferred method: dump all contents into a food processor. Can be used as a dip for french bread and veggies or as a sauce on pasta. Remove all cartilage from crabmeat. Place crabmeat in a large bowl. Mix mayonnaise, pimento, capers, Worcestershire sauce, salt and liquid hot pepper sauce together and blend well. Pour over crabmeat and toss LIGHTLY. Divide crabmeat between eight scallop shells and top each shell with one tablespoon mayonnaise. Sprinkle with paprika. Place shells on cookie sheet or shallow baking pan and bake for 20 minutes in 375 degree Farenheit oven. Serve at once. Carefully remove all cartilage from crabmeat. In a bowl, mix together eggs, mayonnaise, seafood seasoning, white pepper, Worcestershire sauce and dry mustard. Add crabmeat; mix evenly and gently. Add cracker crumbs evenly. Shape into 6 cakes. Deep fry in oil at 350 degrees Farenheit for 2 to 3 minutes until golden brown. Or saute in a frying pan with a little oil for 5 minutes on each side. Instructions:Form crab cakes, then take another cup of bread crumbs, place in bowl, and roll the formed crab cake in bread crumbs. Place on rack in baking sheet or directly in pan if you prefer. Bake in 350 oven for 20 minutes or Broil --BUT WATCH CAREFULLY-- to prevent burning for 7-10 minutes.